Yeah, levelhead is annoyingly amazing. Now I want to do something similar. 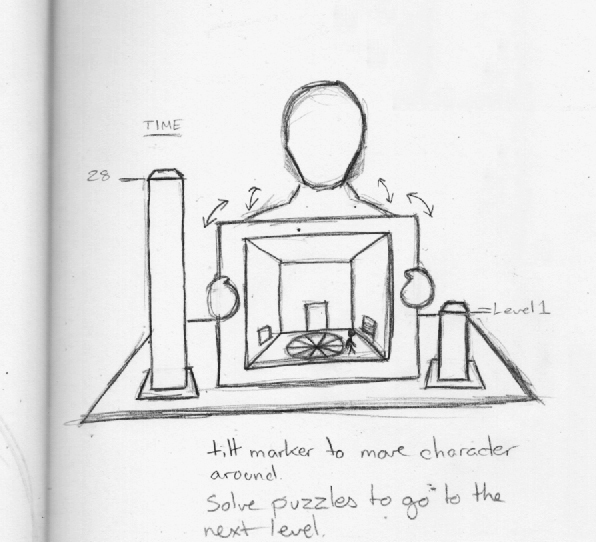 The problem is, how do you make an AR game where you tilt a cube (or markers) to navigate a character around this interior space without ripping him off? I dont think you can really, you can only be inspired by his idea and evolve it. It’s more like the flash game Gateway(i’ll get to that in another post) where you solve very odd puzzles to get to the next room. I’ve also added in some ways of displaying how much time you have left and what level you are on, again through AR. Having to solve puzzles instead of just navigating through different rooms is what I think I can bring to this that Levelhead lacks. Turning this into a proper AR game is what I would like to achieve, something people can play by themselves at home with a browser and a webcam as well as something that would look great in an exhibition. For the exhibit, I could add in extra things like highscores, simpler puzzles so people dont get frustrated and it’s a nice little thing to play with. That’s something I have to test with really.